Must be either Fusion Summoned, or Special Summoned during the turn a Thunder monster’s effect was activated in the hand, by Tributing 1 Thunder Effect non-Fusion Monster (in which case you do not use “Polymerization”). Cards cannot be added from the Main Deck to your opponent’s hand except by drawing them. If this card would be destroyed by battle or card effect, you can banish 1 Thunder monster from your GY instead. Thunder Dragon Colossus wraps up the week, and this Thunder-Type is one of the archetypes boss monsters. Summon it with Thunder Dragon Fusion, or if you can’t wait to get that TDF, tribute a Thunder non-fusion during the same turn a Thunder monster used an effect in your hand. Wow, that’s pretty easy Special Summon requirements for a 2600/2400 monster that locks your opponent out from adding cards to their hand. What a strong monster to open up your game with: Lose virtually zero advantage because Thunder Dragons tend to break even or plus, end with a Fusion monster without having to use a Fusion card, and lock your opponent out from adding cards to their hand. This card can cripple several archetypes from thinning and going through their deck, and even if it won’t stop draw cards, this will slow down almost any deck in Yu-Gi-Oh. There is some irony that Colossus does this while being in an archetype that does so much of this. Protection against destruction by banishing a Thunder Monster in your grave nets you a +1 and keeps your boss monster on the field. Late game this card isn’t going anywhere and can outright win you the duel. The idea that you need ANY Thunder-Type monster on the field to tribute to Special Summon this card the same turn you activate an in-hand Thunder monster is so ridiculously easy in the archetype. That is Grapha-level in Dark Worlds easy or BLS and CED-level easy in Chaos decks. Advanced-4.5/5- Damn near perfect monster, if it was protected from all cards and battle by banishing a Thunder-Type, then it would be 5/5. Art-4.5/5- This whole archetype has some of the best art. Who would’ve thought this would ever happen when Thunder Dragon was first released eons ago? Happy Friday! Thunder Dragon Colossus is near perfect. It’s a Level 8 Dark Thunder-type Fusion monster with 2600 Atk and 2400 Def. A little more Atk would make it perfect. Everything else is just so darn good. Boss monster, easy summoning, alt summoning, no negative effects for you, huge negative effect for the opponent, and finally, built in protection. 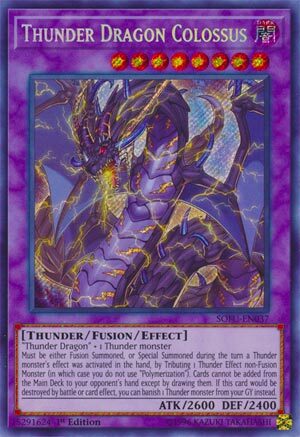 You can Fusion Summon Colossus with Thunder Dragon and any Thunder monster with a regular Fusion Spell (or the theme one obviously) or Special Summon it (no revival) after a Thunder monster activated its effect in the hand and tributing a Thunder effect non-Fusion monster. Combining the old with the new is fun for me and awesome for Colossus. You can also summon multiple Colossus per turn. Once on the field, the opponent is blocked from adding cards from the Main Deck to their Hand. That hurts literally every deck including the mirror match. Just don’t let Colossus be taken and you should be all set to win. The built in protection is destruction prevention by banishing any Thunder monster from your grave. You can use that effect multiple times per turn and Thunder Dragon effects will trigger as well to give you more advantage. Thunder Dragon Colossus is going to be around for a while, and I look forward to owning one when the price comes down. We end this week, and the Thunder Dragon series as a whole unless we end up reviewing the Traps at a later date, with Thunder Dragon Colossus, and it currently draws a $70-80 price tag for a reason besides just being Short Printed. Thunder Dragon Colossus is a Level 8 DARK Thunder Fusion with 2600 ATK and 2400 DEF and requires 1 Thunder Dragon (the original Thunder Dragon) and 1 Thunder monster as materials. Thunder Dragon has a few search options now, so getting to one isn’t hard, and it is much easier to get literally any Thunder monsters, but this does have an alternate summoning condition like Thunder Dragon Titan. ATK and DEF are acceptable for me on a Level 8, Thunder and DARK are good. You can Special Summon this card from the Extra Deck by sending 1 non-Fusion Effect Thunder monster you control to the GY the turn you used the effect of a Thunder monster in your hand. And this is where Gold Sarc becomes a 1 card Thunder Dragon Colossus. All you got to use is use Gold Sarc to banish Thunder Dragondark from your deck and Thunder Dragondark will search a Thunder Dragonhawk, you then use Thunder Dragonhawk in your hand to discard to Special Summon the banished Thunder Dragondark and then you can send the Thunder Dragondark to the GY to summon this (thankfully once again Thunder Dragondark is a hard once per turn for both effects). This is also easy enough to summon without Gold Sarc really, just discard a Thunder Dragon for its effect and then Normal Summon any little Thunder monster to immediately go into this. I should also mention opening Batteryman Solar and Thunder Dragonhawk is also a two card Thunder Dragon Colossus and Some Summer Summoner as well as a monster on the field as long as you send Thunder Dragonroar off Solar, but I won’t explain that combo since it is longer. So, why is it important to summon Thunder Dragon Colossus? Well while you control this card, your opponent cannot add cards from the deck to the hand except via drawing them. Thunder King Rai-Oh was good for so long and arguably still is good and that card prevented both players from searching, so obviously this being easy to bring out and preventing your opponent from searching is outstanding. Finally if this card would be destroyed in battle or via card effect, you can banish a Thunder monster in your GY instead. So more ways to trigger the banishing effects of Thunder Dragons while protecting a one-sided floodgate from battle or effect destruction, I don’t think this card needs anything else to be better without being overpowered or just being unnecessary. This card is outstanding, makes the pure Thunder Dragon deck outstanding to where you can play three of this in your Extra Deck and not feel bad, good enough to warrant a Thunder Dragon engine of three Thunder Dragondark, a Dragonhawk, and maybe a Dragonroar along with three Gold Sarc to throw two of this into any Extra Deck and get a one-sided Thunder King Rai-Oh. Yeah, I think I said more than enough about this card and why it is so good. Art: 4.5/5 All that thunder must be what is stunning the opponent from searching, must be putting an electric current in the opponents deck to where they can only draw. Hands up…how many of y’all didn’t see this card ending week two of Thunder Dragon cards? Colossus is a Level 8, Dark, Thunder Monster, with 2600 attack and 2400 defense…both a little low for Level 8, but still more formidable than not. Fusion requirement here is specifically one Thunder Dragon and one Thunder Monster. A bit odd, but absolutely doable. So, you don’t use Polymerization, and you can only bring Colossus out during Fusion/Special Summon when a Thunder Monster’s Effect is activated in the Hand, for which you then Tribute a non-Fusion, Thunder Effect Monster (what a mouthful there, no?). So, Colossus adds a Lock-down effect, preventing your opponent from adding cards to their Hand from their Deck outside the normal Draw Phase. It should be pretty obvious and apparent that such an effect can really limit and shut down combos of numerous other Decks (and ironically hurt a Deck like this as well) I’d say this would be really painful, because without cycling, even losing it just from the Deck, lots of Decks are losing speed and resources, just hoping to naturally Draw into them. If Colossus would be destroyed by Battle OR Card Effect, you can remove a Thunder Monster from your Graveyard instead. Protection is good, and I appreciate that, and as we’ve seen for two weeks, it’s easy to get the Monsters in your Graveyard to remove (and easy to retrieve once removed) but you still need to keep them there. You might run out, and that won’t always work. But it’s great it protects from both. Next articleYu-Gi-Oh! Hidden Summoners: What You Should Know!